A "brand" is the intangible sum of a product or service's attributes that distinguishes it from others: its fundamental concept, its name and the way it's spoken about or perceived, its packaging and price, its personality and history, its reputation, and the way it's marketed and advertised. Walter Landor, one of the greats of the advertising industry, said, "Simply put, a brand is a promise. By identifying and authenticating a product or service it delivers a pledge of satisfaction and quality." Logical Ideas provides the services of people with skills in brand management. One major part of the "brand" of any organization or community is the commuication that it uses to position itself among those who are a part of the enterprise or who use its products or services. Logical Ideas has people experienced in helping you refine your message for its target audience, and communicate it consistently, effectively and cogently. Seminars, workshops and forums are important parts of the communications and information exchange strategies of many organizations. Logical Ideas can help you plan your conferences and faciltate conference processes. Information and communications technologies are just that - technologies: they're meant to work for you to achieve the result you need for your business or organization. Logical Ideas, working with our partners, can help you with various parts of your information and communications systems, from the architecture of your networks to the people skills you need, to ensure a right fit between your efforts and expenditure and your results. 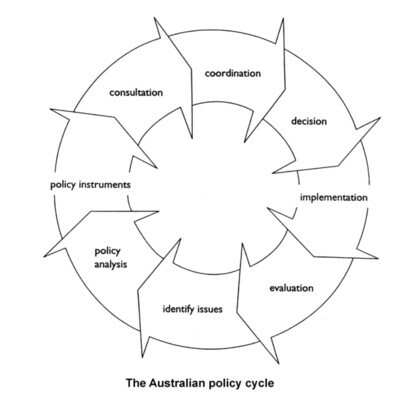 Bridgeman and Davis have described the many stages of the Australian policy development cycle from issues identification through to evaluation. Logical Ideas’ consultants have worked for organizations as diverse as Australia Post, the Australian Competition and Consumer Commission, the Environment Protection Authority and the Department of Justice in just about every phase of the cycle to help shape the evolution of public policies for a more just, sustainable and participatory society. Psychological reports that identify individual histories and family and group dynamics are important components of the evidence that informs decision-making in a range of Australian jurisdictions, from the Family Court to criminal proceedings in the Magistrates' Courts. Logical Ideas’ consultants have prepared hundreds of reports of this kind to help people ensure that tribunals and courts have available to them impartial, independent advice that can be weighed judiciously to help achieve fairer outcomes for all concerned.